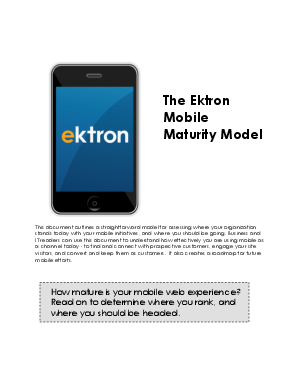 > Ektron > The Mobile Maturity Model: Where does your website rank? Mobile is changing the way people communicate and how companies do business. How effectively is your organization using mobile? Find and connect with prospective customers, engage site visitors, convert leads to customers and retain them by implementing a progressive mobile strategy.